LAS VEGAS – There are few fans or media excited about Floyd Mayweather's choice of Andre Berto as an opponent for their welterweight title bout on Saturday at the MGM Grand Garden, which Mayweather says will be the last match of his illustrious career. Berto is an unbelievably high 35-1 underdog in some sports books, and there is less buzz surrounding the final fight of Mayweather's career than there has been in years. Tickets still remain for the fight and Stephen Espinoza, the executive vice president and general manager of Showtime Sports, concedes the pay-per-view sales aren't likely to hit 1 million. He did say that there are conflicting trends, but said it would not be a shock were it to finish below 1 million. If it comes in at less than 1 million, it will be a decline of more than 75 percent from Mayweather's May 2 bout with Manny Pacquiao. Espinoza said sales of that fight are now up to 4.6 million, which is where he expects them to settle. A backlash from the Pacquiao fight, as well as a belief that Berto has little chance, has put a drain on the interest in this show, Espinoza theorized. "We all know there is a big chunk of the audience that watches Floyd to see him lose," Espinoza said. "To a large portion of those people, Pacquiao was the best chance of seeing someone beat Floyd. And now that that intrigue is gone, I think a lot of those people look at it and say, 'Well, if Pacquiao wasn't able to make it competitive, I'm not sure anyone is going to be able to.' And so, here we are." 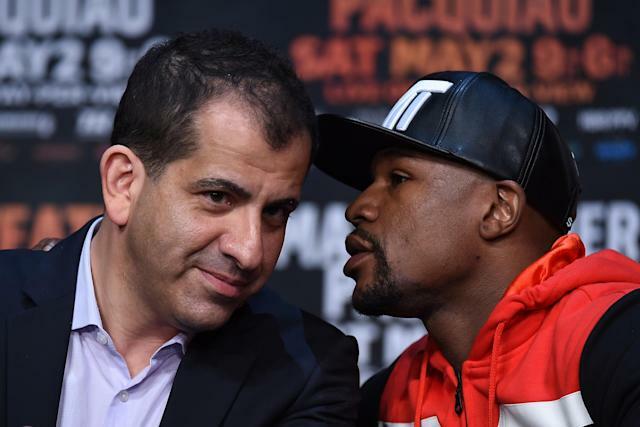 But Espinoza, who is the man who led the successful efforts to bring Mayweather to Showtime in 2013, said the six-fight deal which concludes on Saturday, "was overwhelmingly successful," for his company. The Mayweather-Pacquiao fight broke every financial record that exists in boxing, including largest paid gate ($72 million), pay-per-view revenue (more than $400 million) and pay-per-view sales (4.6 million). Mayweather set the previous gate record for his 2013 bout with Canelo Alvarez at $20 million. The pay-per-view sales, at 2.3 million, are No. 3 all-time and the pay-per-view revenue of $150 million from that fight is second. Espinoza said although expectations for Saturday's bout against Berto are far lower in terms of sales, Showtime is at no risk. "It's a safe deal for both sides," he said. He said that though most fans and media are dismissing Mayweather's threat of retirement out of hand and expect him to fight again, he believes Mayweather is serious about retirement. He noted that Mayweather has talked of retirement many times over the past two or three fights. He conceded that Showtime made Mayweather an offer for a contract extension before he announced the fight with Berto would be his last. "I was as skeptical as anyone six or seven weeks ago, but he sounds pretty definitive to me. And I can tell you behind the scenes, he's never really responded or considered an opening to talk about future fights." Espinoza said he is confident that Showtime will broadcast Mayweather's final fight, whether it occurs on Saturday or whether Mayweather changes his mind and he chooses to fight again. "I do believe that because of the relationship we have, that will be the case," Espinoza said. "Given the respect I think everybody involved in this has for each other, we'll be the ones who do [broadcast Mayweather's last fight]."